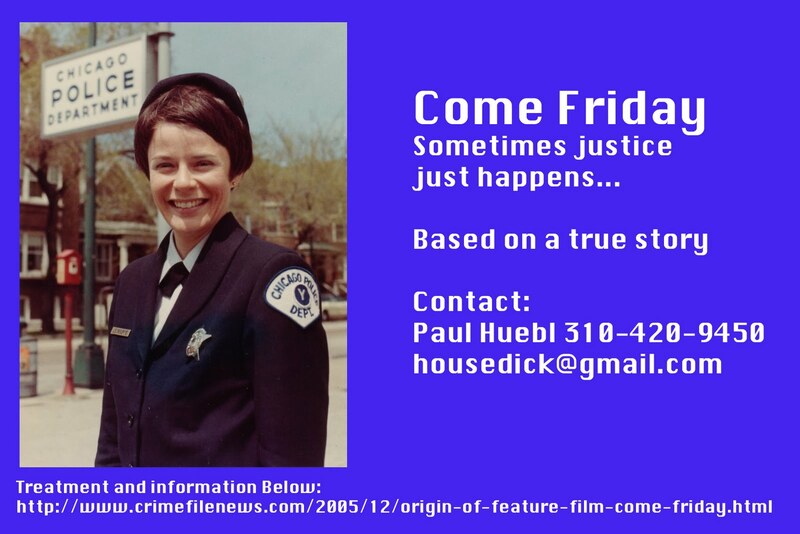 CRIME, GUNS, AND VIDEOTAPE: You can Help Come Friday, the Movie to be made in Chicago! 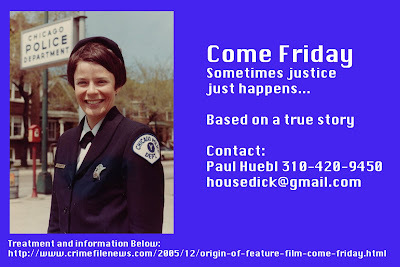 You can Help Come Friday, the Movie to be made in Chicago! Chicago, IL—In 1973 the late Ann Leybourne Erwin Biebel was a Chicago recruit policewoman. Those who were fortunate enough to know her loved her. She retired as an 018 district Civil Service sergeant. She was a great wife and mother whose life was cut too short by cancer. My regular Chicago visitorss know the incredible and exciting story behind her valor award and Medal of Merit that the late Mayor, Richard J. Daley gave her after she was kidnapped at gunpoint and survived under the gravest extreem. It’s a story that reflects well on the department and the superior training provided to the officers. The department needs all the image building it can get right now after years of less the desirable administration. The City and department morale can only go up from its decline and we must wait and see what the new mayor will accomplish in the way of bringing back the taxpayers, business and jobs that have fled. Placing the baggage of President Obama or Richard M. Daley on Mayor Rahm Emanuel is unfair. We must give him the opportunity to improve and repair the broken relationship between rank and file cops and the fifth floor of City Hall. That relationship should not be about politics but for the safety and wellbeing of Chicago’s taxpayers. Old man Daley had a great relationship the police that his son somehow managed to destroy. I’m asking every Chicago reader to write Mayor Emanuel and ask him to offer Chicago’s full cooperation to his brother Ari Emanuel in the making of Come Friday. Ari Emanuel is the founder and CEO of Endeavor William Morris Talent Agency in Beverly Hills. He is one of the most powerful men in Hollywood who could make Come Friday an unforgettable film. Making this film would bring Chicago revenue, jobs and there would be loads of extra roles for Chicago cops. Once Come Friday is made I’m up to finding and creating more films that chronicle the heroes of the Chicago Police department. I just need a little help getting the first one off the ground. If it was made I'd pay to see it. Will it be made Paul?